Two of our University of Canberra (UC) Scholarship Awardees attended the club to give us an update on their progress. Jessica Catlin is now in her fifth and final year of a double degree in Law and Forensics, and Kelsey Drabsch (pictured above) is in her third year of a four-year Event & Tourism Management and Sports Management Degree. Early in 2017, Jessica needed to take 8 months off work due to major surgery. At the same time, she lost her government supported funding and as a result was considering taking a gap year from her university studies. When reviewing her budget, she realised that the RC Hall Scholarship funds she received for the year meant that she would be able to continue at uni, complete her final year of studies on time, cover the physio and medications she required as a result of the surgery, and she didn’t need to rely on others financially. 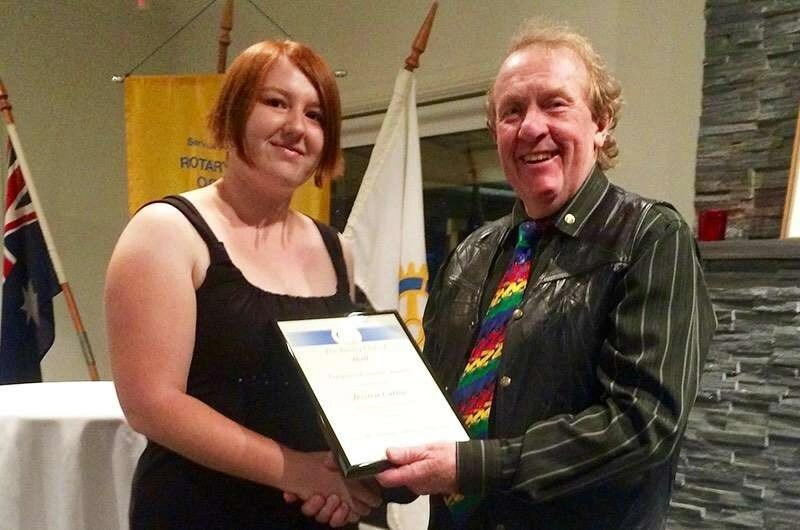 As with other RCH Scholarship recipients, the funds the club has made available to Jessica has meant the difference between completing her studies and graduating as planned. She will complete her placement at a local voluntary law office and continue her studies with a Graduate Diploma of Legal Practise in order to become the lawyer she has always dreamed of being. This is Kelsey’s final year of her scholarship, and she has one more year of study to complete her degree. The RC Hall Scholarship enabled Kelsey to achieve her ambition of volunteering as an event assistant at major events including the Country Music Awards and Groove in the Moove, as well as being a production assistant at the Logies and having an internship with Brumbies events. Her association with RCH and the scholarship has assisted in paying for flights and accommodation for the interstate events anther studies, textbooks and campus events, giving her the opportunity to be involved in the community and helping others through RYLA as an attendee and mentor. Kelsey is on an exchange until the end of 2018 to UC partner university, Brooke University near Niagara Falls in Canada, where she will expand her studies in sports management, adjust to a different culture while living campus and involve herself in local Rotaract/Rotary clubs. The highlight of her exchange is likely to be the opportunity to volunteer at the Canadian Country Music Awards where she is hoping to meet Keith Urban and Shania Twain, amongst others! Earlier in the year Brendan King touched base with the club, we witnessed Emma-Lee Knight graduate as a Nurse and we learned that Chris Moore is determinedly completing his IT studies by correspondence around his full-time work-load with Unisys. Other scholarship students are successfully continuing with their studies and two more 3-year scholarships were awarded in May 2018, bringing our active scholarships to 8. As a club, we can be proud of the accomplishments of these impressive and determined young people and of the results we are seeing from the support provided to them through the scholarships program.